A friend of mine had that on the teevee just last night! I was excited; I've thought Robert Hazen had a really interesting perspective on biogeochemistry since I read the original "Life's Rocky Start" in Scientific American. O, CO2 , and O2 ; and (3) the generation of far-from-equilibrium conditions by living systems. The sequential evolution of Earth’s mineralogy from chondritic simplicity to Phanerozoic complex- ity introduces the dimension of geologic time to mineralogy and thus provides a dynamic alternate approach to framing, and to teaching, the mineral sciences. Hello do you have any idea what this stuff could be ? it´s partially glassy and the rest is porous. It´s quite hard but not very heavy. Looks like some form of common opal, or mix of clear, white base opal, creamy opal, opal with various impurities. Possibly a sedimentary deposited form of SiO2·nH2O. If so it explains why it resists the acids you tried, you need HF (or hot NaOH?). Just guessing but it looks nearly identical to a form I found near the Hieroglyphic Mountains in Arizona. An entire side of a mountain all the way down into the valley of the stuff. They were completing the dam project and before I could do much digging and investigating the whole area became part of the bottom of what is now Lake Pleasant. Bastards. I never learned how to use scuba gear. Decades ago the whole area was loaded with incredible amounts of cyanide in leach beds by an old timer known to the area as 'Cyanide Harry'. No I never went swimming in that lake but many do. Either the state officials in charge of the project did not know or were not concerned as no cleanup was ever done of that valley before they flooded it. Off topic but a little bit of history that may interest someone. One of the many reasons I only drink bottled spring water, you just cannot trust municipal water supplies. I also thought that it is opal but I'm not 100% sure becouse opal isn't a common mineral in the locality where I have found it. And the porous material looks like some vulcanic rock ( maybe ryolite??) but the locality where I have found it is core mountain. Maybe it could be some artificial material but what the hell it could be ? So I'm confused a little bit about it . I am not sure that it is opal ("potch" - opal without coloured bits) . potch tends to be amorphous, but this is clearly broken crystals with a cleavage inside the crystal that resembles broken opal (and many other materials). I think more investigation is needed here. and also potch is very soft. easy ground away with sand paper, so I am tending to discount opal as very likely. I can see a number of places where there is evidence of 120 degree facet angles suggesting perhaps it is a badly smashed quartz cluster on some sort of matrix. there is also a greenish looking material that has a "bubbly" looking habit. this may be prehnite which is known to associate with quartz. 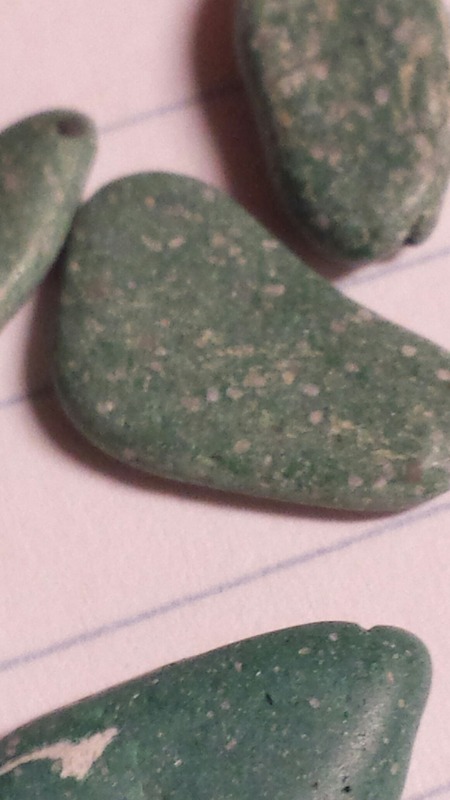 if the location is known, see if prehnite is typical to the area. the material is far to porous for rhyolite, btw. Looked up close at all 4 pics again and in some areas I want to agree with diddi but in others like the smooth rounded areas in pic4 I don't. Unless some process in nature could form such smooth rounded areas in what is actually a crystal structure. Very tough call when one cannot hold it in hand. The Opal I found years ago was a milky white with some places trending to clear unlike these pictures. Seems he could break off a piece in one of the smooth rounded areas and look at the exposed surfaces for indications of actually being a crystal structure. As was stated in another post trying to determine minerals is a hard call from nothing but images. Will prehnite resist all the acids he tried? not sure about the prehnite with acid, but I can find some to try. yeh, it is very tricky to tell anything much without having a good look and to feel the texture, density etc. water wear will soon cause that sort of rounding, and prehnite has a natural round habit anyway, so a bit of weathering could do the trick. it would be interesting to crack it open or cut it. In pic 1, is that a small selenite rose in the the lower left of the specimen, that I see? I'm not sure, but I don't think that would react with those acids either would it? I get the impression of a shattered vug collapse followed by hydrothermal deposits. Another sneaky death rock in the news. It's not selenite because the whole specimen is pretty hard. When I put a piece into fire it was glowing with yellow-orange colour and the edges has rounded. And it doesn't react even with hot HCl (prehnite should react as far as I know). +It looks more like some glass then crystals. I add some detail images . What did u mark here? No it isn't calcite because it doesn't react with HCl. I'm not sure if it's barite, it looks like cracked glass or something similiar, I don't think that it's crystal structure. Is there any good test on baryte (beside its density)? If it was Calcite this property should be evident. So what are your conclusions about this rock? I know it's hard to tell from an image but I want to know your final opinions anyway. They're naturally that green, as far as I can tell. But what are they? I noticed quite a few lava-rocks on the beach as well, if that helps. EDIT: Close-up of a few of the rocks. 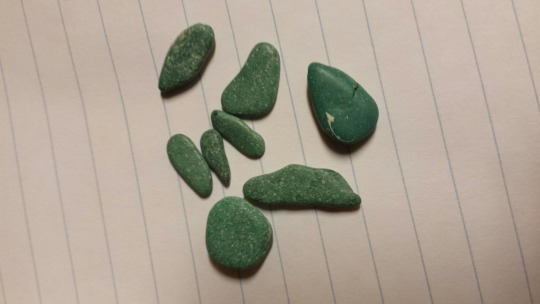 Lots of little fun facts about our tiniest rocks and the global impact of what we're doing. Quite an informative documentary really. "Selling sand to the Arabs"
"Desert sand is the wrong kind of sand." Some aspects of mica, interesting to see the source and how it's mined. Looks like Hazen and company have another publication on this subject! Geologists have identified about 200 minerals that formed due to the hustle and bustle of human activity. Many of these unintentionally formed minerals appeared on Earth during the past two centuries, a blip in the timescale of thousands to millions of years that geologists typically work with. “We are inadvertently forming new minerals all the time,” says Marcus J. Origlieri, a coauthor on Hazen’s paper and an expert on rare minerals at the University of Arizona. Origlieri notes that many of the 208 minerals were only recently discovered in mining tunnels and smelters left over from Cold War-era uranium extraction and processing. “Because the mines have been sitting idle without any forced airflow, the humidity conditions are probably ripe for some of these things to form that wouldn’t have formed otherwise,” says Anthony R. Kampf, a curator emeritus at the Natural History Museum of Los Angeles County. He identified more than two dozen of the minerals on Hazen’s list. I haven't read the article yet, but it looks interesting! I found these close to a galena mineralisation. It looks like someone stuck some gum to the rock. Im think it is wurtzite or quartz. Copper scratches some parts of it while others scratch glass. Maybe a mixture? Clearly i have no idea. Neat! As for the tan/clear rock above, I'm beginning to think it's chalcedony or something similar - quartz doesn't react appreciably with many acids. Try NaOH and see if that changes?